I definitely in the midst of what has been called the honeymoon stage of studying abroad – practically everything you see and do is wonderful, and it’s as though Europe can do no wrong. I’ve done a fair amount of exploring of Marburg over the past few days and I just really love this city. In particular, the Oberstadt (upper city) is pretty much everything you could want in a small European city: tons of specialty shops, pubs, cafes and street musicians amidst winding cobblestone streets framed by timber-frame buildings. 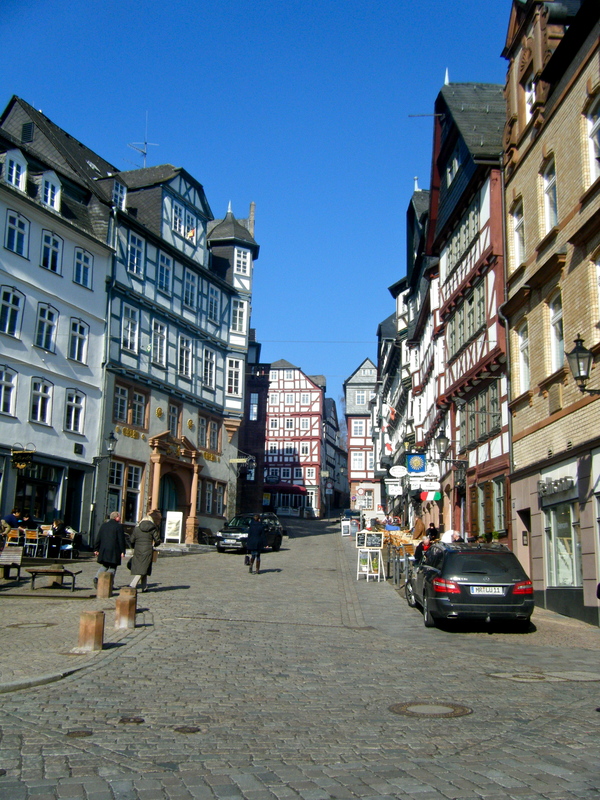 There’s just so much more here than I realized, and I didn’t expect to spend multiple days exploring Marburg – I thought it was too small. The Markt in the Oberstadt, full of more European quaintness than you can shake a stick at. We went on an organized tour of the Oberstadt yesterday which was extremely interesting and informative. I felt a bit lame opting for the English version instead of the German, but I’m glad I did because that ensured I understood everything and didn’t miss out on any interesting details, such as that the Brothers Grimm studied in Marburg or the history of the unearthed ruins of a 14th century synagogue in the city. I’ve also had a great time getting to know the international students during our orientation over the past few days. I have been a little frustrated at times because they haven’t been good about informing us of what we’re doing when (making it hard to make outside plans and also meaning that we sometimes didn’t bring documents that we’d need that day) but overall I have gotten so much out of these few days. They’ve helped me fill out all my necessary paperwork, and I’ve also gotten to meet some awesome people. I’m not sure how much I’ll see them all once we start our language course on Monday, since we’ll be divided according to our language capabilities, but hopefully we all still get together a lot. I’m trying to rally some people to go to Frankfurt tomorrow. We can get their for free because being enrolled in the university means we get free train rides anywhere in the state of Hessen. So it seems to me, if we have nothing better to do tomorrow and one of Germany’s largest cities is only an hour away, why shouldn’t we go?